We are currently out of stock. Enter your email below to receive a back in stock notice. More stock should arrive on: 5/2/2019. Our 16 oz. 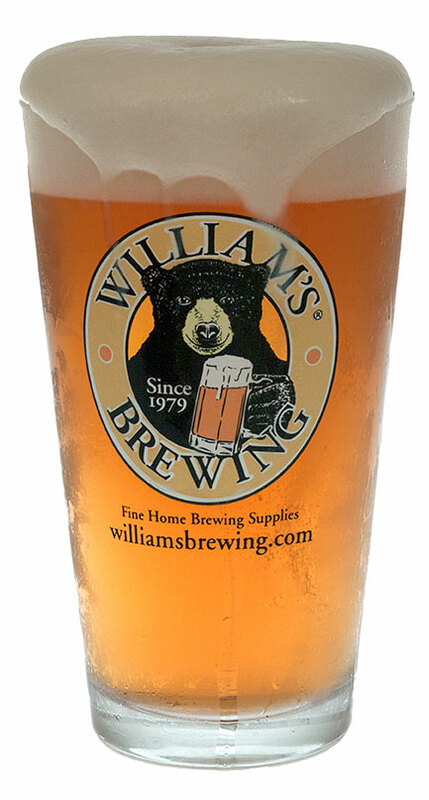 Nucleated Pint Glass features the William's Bear Logo, first developed in 1981. What is a nucleated pint glass? It is a standard beer pint glass with a delicate pattern of pits in the bottom that form a point to break C02 out of solution. Without nucleation, a head cannot last for more than 3 or 4 minutes. Our William’s Pint Glass now features a nucleated bear paw pattern etched on its bottom, which keep a steady stream of bubbles rising to the surface from the center of the glass, preserving head. The fine hop pattern nucleation is slightly exaggerated in the photo at right, so it is clearly visible. Made in U.S.A. by Libbey. from Lanse Very nice beer glasses! These glasses work exactly as advertised. They are a very nice quality beer glass. They came very well packed and arrived in great condition! The neucleation points are great and keep a nice head on your beer. I highly recommend these to all of you. The price gets even better if you buy 4 or more! Standard glass, printing on side looks and feels to be high quality. The etching in the bottom is great. I have multiple other etched bottom glasses, but this is the only one with a nice design instead of a bunch of dots. from havre de grace AWESOME! These nucleated glasses keep a constant stream of tiny bubbles flowing from the bottom up to the surface and that maintains nice lacing. I even think my home brew taste better and very smooth. The only complaint I have is my shipment was packed with flimsy bubble wrap and one of the glasses arrived shattered. It works. The etching promotes bubbles, helping retain the head. Classic pint glass, too.